The Challenges Facing our Parliaments: How can we improve their performance? Performance Indicators for the Parliament – Sharp or blunt instruments of reform? 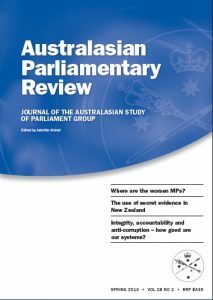 Select Committees and their Role in Keeping Parliament Relevant: Do New Zealand select committees make a difference? The Three Committee Systems of the Australian Parliament – A developmental overview? The Grand Inquest of the Nation – A notion of the past? Culture of a Parliamentary Bureaucracy: Can Fiction be Fact?